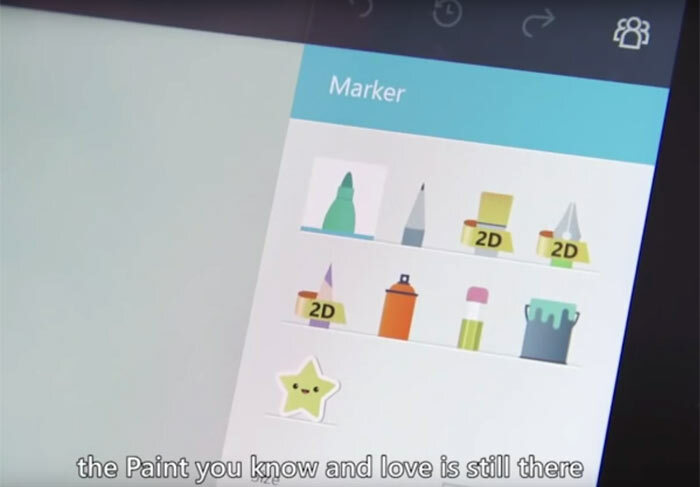 Microsoft is working on a significant revamp of its Paint app. Paint has remained largely unchanged over many years, through many revisions of Windows, so an update to add features and 'reinvent' it is definitely due. Twitter user WalkingCat (via The Verge) discovered a new Paint launch video which shows the overhauled app in action. In the video above you can see that the new Paint represents a significant leap ahead in functionality and usability. It is said to be "completely redesigned… and packed with cool new features". You can see the app in operation on a Surface computer with plenty of use of the Surface Pen, and a clear touch-friendly UI..
3D functionality stems from not just the availability of 3D preset shape manipulation but the ability to create 3D freehand shapes. The models can be simply and intuitively coloured and manipulated. 3D images in your compositions are shown to blend well with imported 2D photographs, text, stickers and so on, to create vivid imagery which can be re-composed with 3D scene camera movement tools etc. Microsoft will build a community around the program for swapping and sharing images, 3D model presets, and user creations. Microsoft has confirmed it is holding a Windows 10 event on Wednesday, 26th October, 10 am EDT, New York. The firm teased "Imagine what you'll do," and it looks like at least one answer to that is: "create some 3D images in Paint". If you can't wait to have a dabble in the new Paint you can test it out via a download available from Windows Blog Italia (this isn't a recommendation, download it and run at your own risk). They are changing paint? At a time when they are trying to push apps to the store? I do wonder about Microsofts marketing department at times…..
To be fair I can see why they are doing this. Seeing as one of the main selling points of the surface range is the stylus having a ‘good’ drawing app to showcase it is probably a good thing. Would I use it seeing as I work in the design industry….nope. It looks like a UWP app to me. Cool, maybe it'll be able to handle transparency now and have a magic pen function like in paint.net.